Very well maintained mountain home on 1.35+/- AC in Indian Hills Development. Move Right in this immaculate home. Double Covered Porched, Oopen Floor Plan with 2 Rock Fireplaces. Gourmet Kitchen, Hickory Cabinets, Vaulted Ceilings, Master Suite has sitting area and window seat. Oversized Garage, low maintenance yard. 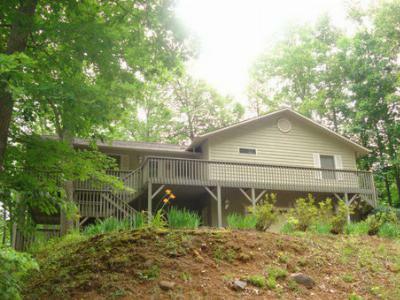 Located in Franklin, NC, less than an hour to Cherokee, NC and Harrah’s Casino, 70 minutes to Asheville, NC and only a 2 hour drive from Atlanta, GA.
Schools servicing this home are Cartoogechaye Elementary, Mountain View 5-6, Macon Middle and Franklin High School all within 10 minutes from this home. The area is a haven for Hiking, Kayaking, Hunting, Gem Mining and Fishing….a true mecca for those who love the outdoors.